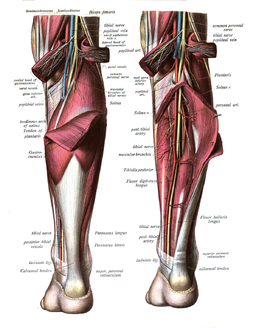 The Tibial Nerve is one of the two main muscular branches of the Sciatic Nerve . TheTibial nerve is the larger terminal branch with root values of L4, L5, S1, S2, and S3. The Tibial Nerve provides innervation to the muscles of the lower leg and foot. Specifically: Triceps Surae ( the two headed Gastocnemius and Soleus); Plantaris, Popliteus; Tibialis Posterior; Flexor Digitorum Longus; and Flexor Hallucis Longus muscles. It also has articular and cutaneous branches. At the foot level (just after the heel) the Tibial Nerve divides into the Medial Plantar Nerve (MPN) and the Lateral Plantar Nerve (LPN). The MPN supplies muscular branches to the big toe and the two toes next to it, and the LPN the other two toes. The Sural Nerve is a cutaneous branch of the Tibial nerve that supplies the skin of the legs and feet. At Popliteal Fossa region branches of the Tibial Nerve supply medial and lateral heads of gastrocnemius, soleus, plantaris and popliteus muscles. The popliteus branch goes on to supply tibialis posteriormuscle, superior tibiofibular joint, tibia bone, interosseous membrane of leg, and the inferior tibiofibular joint. Back of the Leg branches of the Tibial Nerve supply tibialis posterior, flexor digitorum longus, flexor hallucis longus, and deep part of soleus. Medial Sural Nerve supplies skin on lower half back of leg and skin of foot laterally till little toe. Medial Calcaneal Nerve supplies skin on posterior and inferior surface calcaneous. Articular branches are to the knee joint ( 3 in total) and ankle joint. Injury to the Tibial Nerve can cause motor loss and altered sensation and pain to any of the areas it supplies, depending on site of involvement. Popliteal Fossa region. Injury may occur due to eg. Space occupying lesion; Laceration injury; Posterior dislocation of the knee; Entrapement in Soleus arch. Soleus arch entrapment neuropathy can occur with sports that make special demands on the calf muscles. Swelling and hypertrophy of the soleus muscle may cause its tendinous arch to compress the popliteal artery and vein as well as the tibial nerve. This can cause chronic mechanical damage to the nerve and the artery and vein may become occluded. This is requires surgical release and has a good outcome. Physiotherapy post surgery would include: mobilising the nerve ( eg flossing techniques); strengthening and muscle flexibility graded exercises; coordination and balance training. Electrotherapeutic techniques (eg. TENS) or heat may be used to aide pain relief. Medial Malleous Level. Compression of the tibial nerve in the Osseo fibrous tunnel below the flexor retinaculum of the ankle causes a condition termed Tarsal Tunnel Syndrome. On examination it presents as pain and paresthesia in the sole of the foot, For a full assessment and treatment of this condition se Tarsal Tunnel Syndrome. Sole of foot. Abnormal pressure at the ball of the foot can irritate the first plantar digital nerve causing Morton's Neuroma/Metatarsalgia.